3. Improve performance of engineering process and prototypes. 1. Providing our extensive consulting experience accumulated across a wide range of industries. 3. Knowledge transfer to enhance the CFD capability & sustainability of our partners and thereby maximising the ROI value of their business. The newly designed green building is intended to be a beacon in sustainability design and energy efficiency, for which the ventilation strategy is being designed as a low energy free cooling system. CFD studies were carried out to assess the feasibility of different design features, such as venturi effects, natural convection, solar chimney and wind sensitivity. Our client installs Server Houses under their transmission antennas to generate mobile coverage for their customers. The Servers generate 5kW of thermal heat and the cooling dissipation system is not optimized. 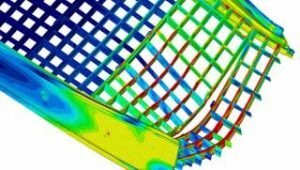 In order to cut down electricity expenses and improve energy efficiency, an energy simulation and CFD study were carried out to optimize the system. Several cooling devices and configurations were analyzed. Eventually, a wind-induced extraction system over the exhaust of the server was implemented as the most energy efficient one. 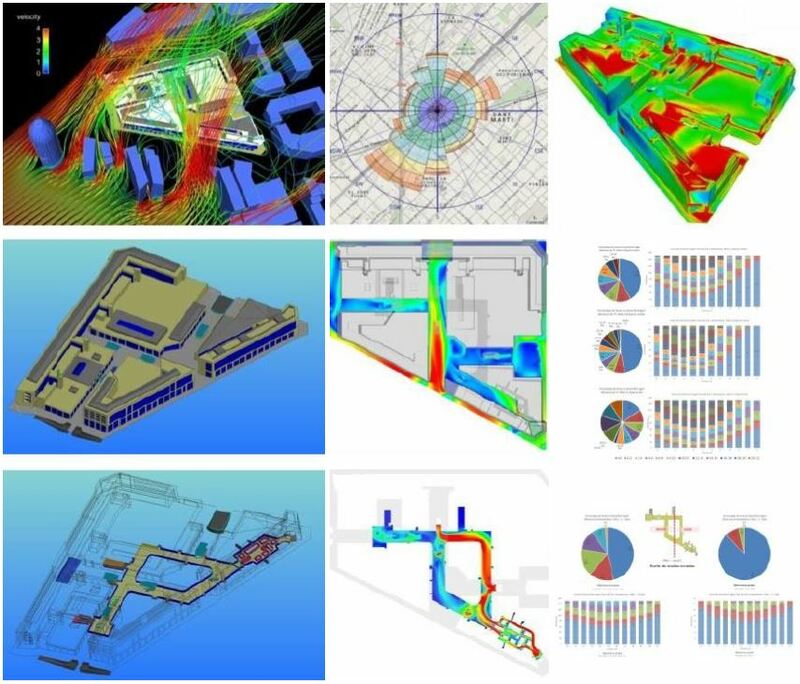 Below is a selection of some CFD consulting projects and CFD services that we have successfully delivered to our clients. Due to the sensitive nature of the consulting work involved, we seek to not disclose details of our client’s identity. 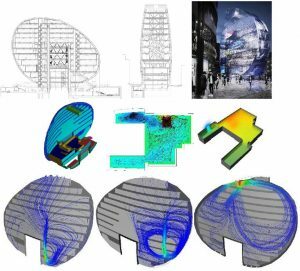 In the case studies section of past CFD consulting projects that we were involved in, you’ll soon find our professional work as consultants are universally applied to a diverse range of projects. 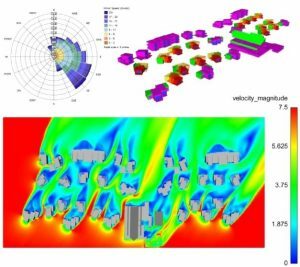 ● Simulation, Study and Optimization of Natural Wind Flow Around High rise Buildings & Effects on Surrounding Built Environment using Computational fluid analysis. This involves the Simulation, Analysis, and Optimization of wind Velocity vectors distribution in Housing apartment when subjected to prevailing Wind conditions available. ● Mitigation of Heat Stacking Effect caused by Recirculation of Hot Exhaust Air Discharged from Air-Conditioning Condenser Units. ● Base on the flow patterns of Particles trajectories of the exhaust air discharged from air conditioning condenser units, we are able to assess if whether there is a recirculation of hot exhaust air back into condenser units. A recirculation of exhaust air can result in significantly higher exhaust air temperature & temperature within air well. 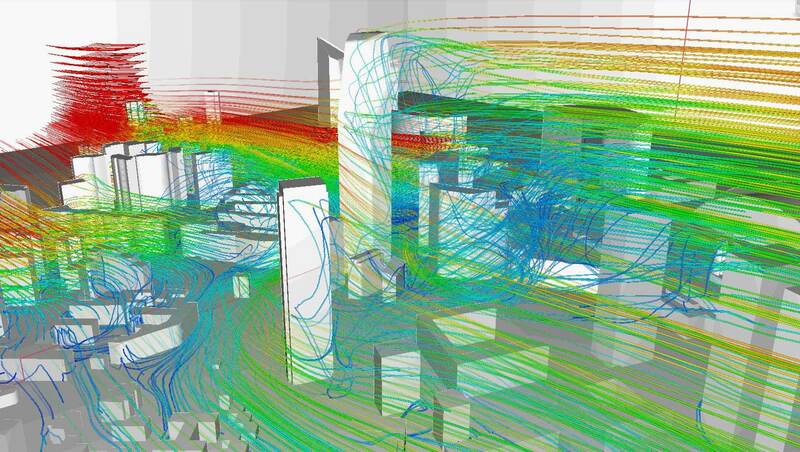 ● This involves simulating and studying the Temperature distribution contours on selected cross-sectional planes in the building which takes into account various heat sources such as building occupants, and thermal heat loads from the sun. ● Base on the Building design, taking into account available exhaust vents & typical environmental wind conditions, we are able to use fluid dynamic analysis to simulate Smoke plume caused by a fire outbreak in, to get accurate insights of the smoke movement into an external environment. ● We are able to accurately Simulate and Predict Complex dynamic Airflow Behaviour, Thermal contour distribution & Smoke Movement (Visibility Level) under various Fire outbreak Situations & Operating Conditions. 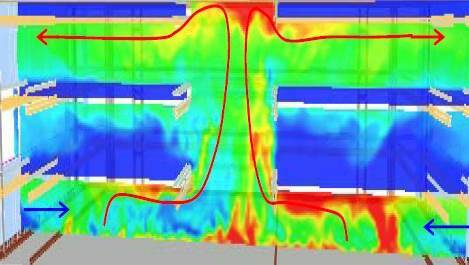 Base on CFD simulation models, we are able to accurately assess and predict stratification of smoke (layering) which is caused by a loss of smoke buoyancy near the building ceiling. 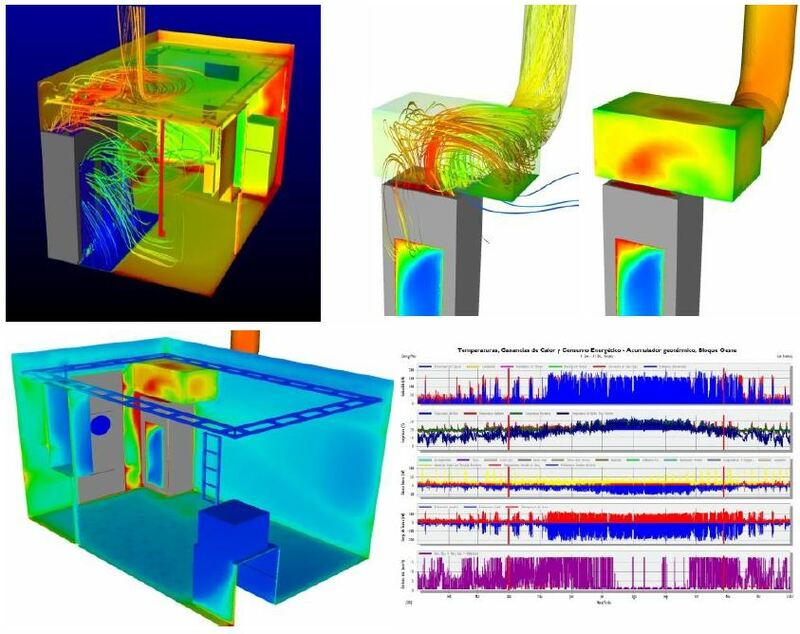 ● Through precise CFD simulation, we are able to accurately predict Particles trajectory Distribution of exhaust air discharged from building exhaust ducts located in the building roof area. 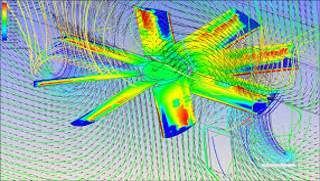 ● Base on this simulation CFD modeling, we can assess whether there is an ingestion of airborne contaminants from upwind Exhausts ducts by building ventilation air intakes, which is indicative of a re-entry of airborne pollutants back into building roof area. 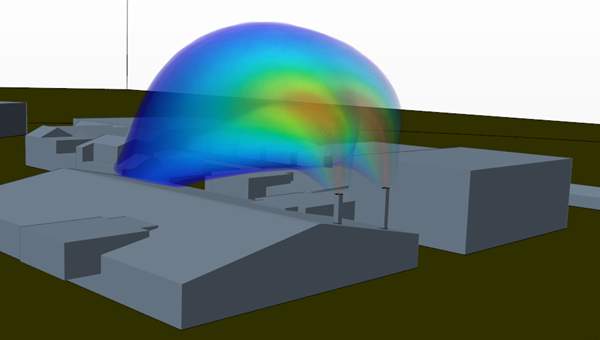 Using CFD simulation tools, we are also able to accurately predict the Dispersion movement of air pollutant plume discharged from building exhaust fans. The distribution patterns of the pollutant Particles trajectories is an accurate indicator of contaminant dispersion downstream into nearby residential Buildings. ● Optimization of Surface temperature emission of Die & Lead Frame in Metric Quad Flat Pack (MQFP) due to natural convection cooling in JEDEC enclosure. 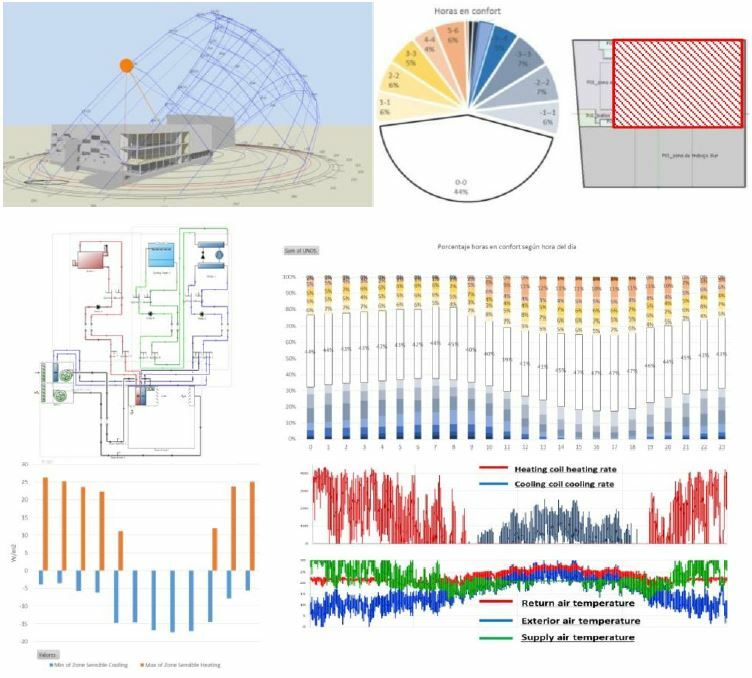 Our client wants to remodel the small and needed to address the thermal comfort level reached in some spots under the strong prevailing wind current flow in the region. 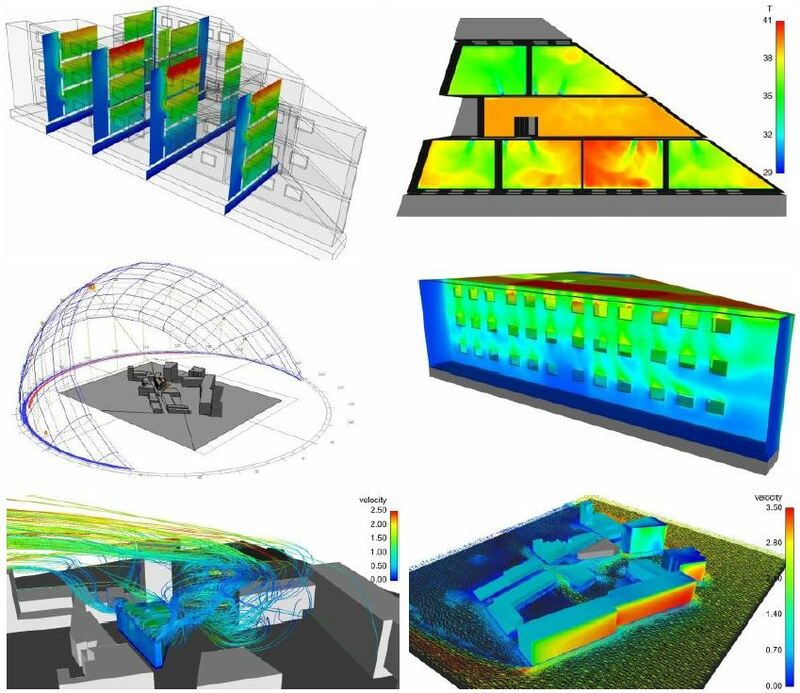 Dynamic thermal comfort study was carried out, along with comfort and radiation analysis in the enclosed terrace areas. Different set-ups of windscreens and flowerpots were designed and evaluated in order to maximize interior comfort conditions (along with greenhouse effect, climatization of spaces and circular wind currents created by the mall´s circular shape. As part of the climate, strategy different enclosure options were systematically analyzed in order to minimize energy use and maximize the energy efficiency near fully-automated logistics center. Specific 3D CAD models were created to analyze the energy performance and thermal comfort characteristics of different climatization options. Special efforts were made to maximize comfort times in working areas. This is the new competency development project with an Automotive client. The objective of this CFD consulting project was to predict the ice melting pattern on the windshield at 15 min,20 min, 25 min & 30 min. 95% of the ice has to clear within 25 mins. 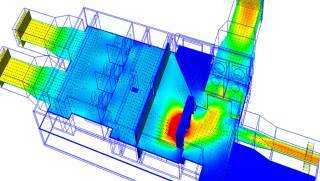 Our CFD engineers modeled the full cabin along with HVAC for this analysis. Initially, this simulation was done at steady state once the flow has been developed the simulation is switched to a transient case and the flow equations will be frozen and energy equation only switched on. We successfully developed this competency development project and my CFD results were 98% correlated with experimental results. An opensource CFD solver SU2 is used for simulation and Pointwise was adopted as the mesh generation tool. Simple wings like HIRENASD to complex structures like whole fighter aircraft (LCA) were studied. Plots of various flow parameters are in agreement with experimental results. With this validation, the analysis is carried out for critical values and thus helped in carrying out safe experimental tests. 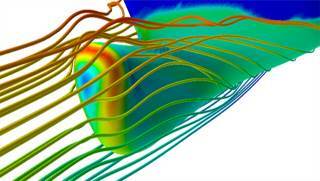 The objective is to incorporate user-defined motion for mesh morphing in unsteady flow analysis. A code is developed within SU2 in C++ language. Here the surface mesh is changed according to the equation that user has fed into the solver. Then volume mesh is morphed, this, in turn, alters flow field. This code developed helped in specifying an equation of motion of choice and use it for fluid flow analysis. For the last few decades, engineers dealing with the design of bridges, offshore structures, electronic chips etc. have been studying the fluid-structure interaction of the bluff bodies. The fluid-structure interactions are studied by a common approach wherein the body is forced to oscillate with a predefined motion that actually resembles the flow-induced vibrations. For the present CFD consulting study, an in-house SUPG-FEM algorithm based on non-inertial frame approach is employed. In the present algorithm, the effect of the non-inertial frame is represented by a simple source term in the transverse momentum equation. It facilitates computational convenience by avoiding the re-meshing of the whole domain that is required if a fixed inertial frame were used instead. Accordingly, the rectangular cylinder was forced to vibrate for various configurations such as the Aspect Ratio, Reynolds number based on the depth of the cylinder. The frequency ratios chosen for the study are 0.5, 0.75, 1.0, 1.5 and 2.0. The oscillating amplitude ratios considered for the cylinder are 0.1, 0.2 and 0.3. The pressure and the surface tangential component of the cylinder acceleration play an important role in the vortex formation and shedding. As the flow attains constant periodicity, vortices with an alternate sense of rotation are shed behind the rectangular cylinder. The influence of the cylinder vibration on the wake patterns, phase plane, lift force, drag force etc. are presented and discussed. It is observed that the force coefficients are high at harmonic frequency ratio for lower amplitudes, as the amplitude increases the maximum value shifts to superharmonic case. The objective of this CFD consulting project is to predict the thermal heat loss from the building floor ducts by using the different type of insulation materials with different insulation thickness. Overall for this CFD simulation study, L1 to L12 cases was done and each case has four different subsequent iterations, totally 48 iterations were done. This project got a best DFSS award. The objective is to minimize the pressure drop. By using the CFD studies, our engineers were able to have minimized the pressure drop less than the maximum limit. The objective was to calculate the separation distance after the release of the store from an aircraft. Native DFBI model in StarCCM+ is used for the simulation of before mentioned study. An overset mesh is generated for the same purpose and investigation is done. The objective of present work is to explore, the effects of different aspect ratios (AR) and Reynolds number (Re) on unsteady laminar fluid flow past a stationary rectangular cylinder. For this purpose, equations governing laminar fluid flow are solved in a Cartesian framework using an in-house code based on Streamline Upwind/Petrov-Galerkin finite element method (SUPG-FEM). Velocity profiles, instantaneous vorticity contours and streamline patterns were used to identify different vortex shedding regimes. In downstream of the cylinder, unique vortex shedding regime which is associated with stretching and stronger rotation of vortices is observed. It is not observed for the other bluff bodies like circular and elliptical cylinders. Further, the results of aerodynamic force calculations such as lift, drag values, and Strouhal number are discussed in detail. The present study can be applied to analyze fluid flow characteristics of MAVs, flow past tall buildings, flow past rectangular and design of the electronic chips. 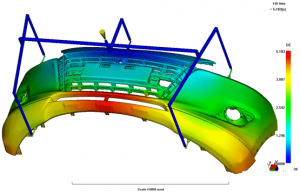 All of our CFD simulation modeling work models has been extensively benchmarked by actual validation experiments and in-service testing, which gives us the to have the capability to offer world-class CFD consulting service to our clients. BroadTech Engineering has continually expanded its client base and has more than 250 consultancy projects to its credit. 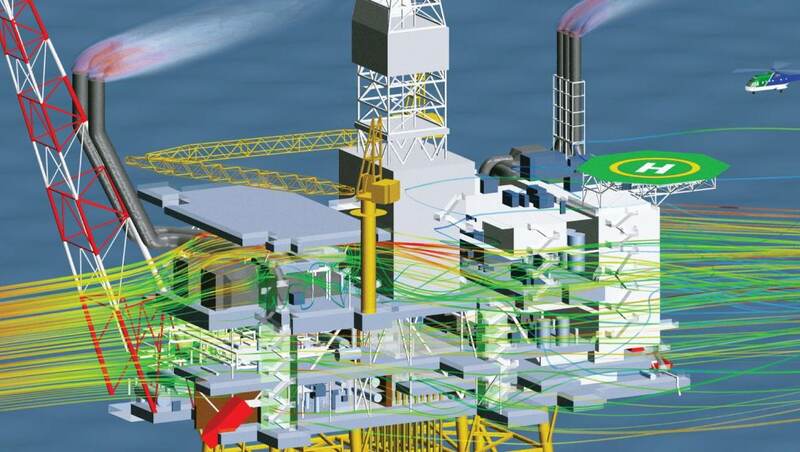 Our extensive portfolio of past CFD case studies with Prominent Clients provides concrete evidence of our proven track record of success in each and every CFD consulting projects that we are entrusted with. We strongly believe that our broad of experience across a diverse range of industry allows us the unique position to offer our clients a fresh perspective when approaching their CFD technical challenges. 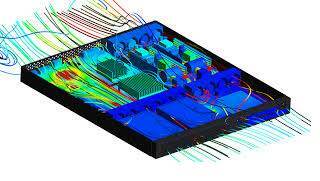 In addition, we are also able to gather new ideas and best practices from each of the different industries and creatively apply it to your CFD simulation projects. This collective experience that we are able to offer benefits our clients tremendously by enabling the cross-pollination of ideas and innovations between industries that have shared common physics but different structures. For example, a client had a flow-control value in a large water storage reservoir that under standard flow calculations would have required an expensive design modification to handle the estimated forces. 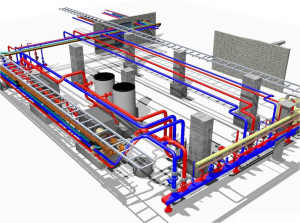 Our CFD consulting analysis revealed that the manual hand-calculations were overly conservative and that the existing, budgeted design was more than adequate. Following our recommendations, the client went forward and the valve is operating per specifications. 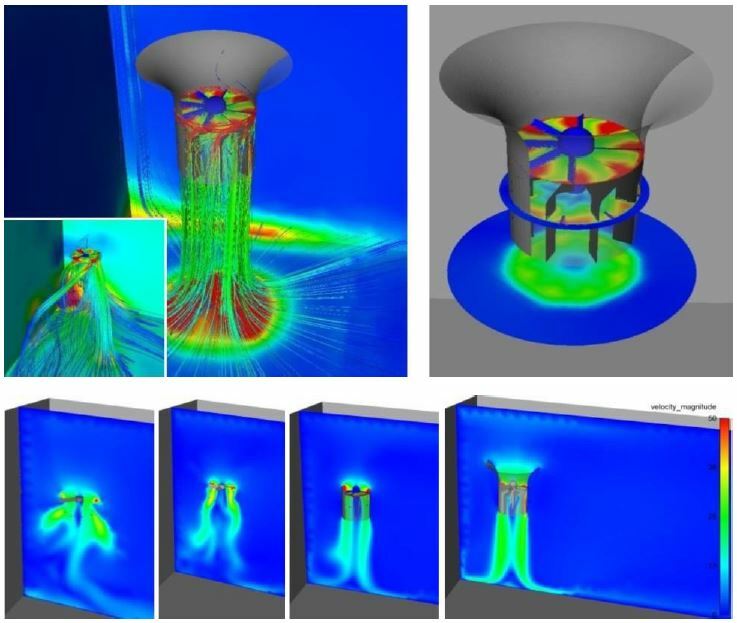 We know from our prior CFD service work on wind loaded structures, that given subject to the same flow physics, the valve structure would perform similarly. In the interpretation of CFD data results, the experience is the key in knowing whether one has a false result or a genuine result that should be taken into consideration. We strongly feel that this is our competitive differentiation and a proven value proposition that we can offer to our CFD consulting clients. Learn more about what our CFD consulting services can do for your company now by simply calling us at +6581822236 for a no obligation discussion of your needs. BroadTech Engineering was founded by a team of engineers in partnership with Dr. Victor Wu, a prominent Professional Engineer, and internationally recognized CFD authority. He has under his belt over 40 years of CFD related experience in the area of academic research as well as industrial consultancy. 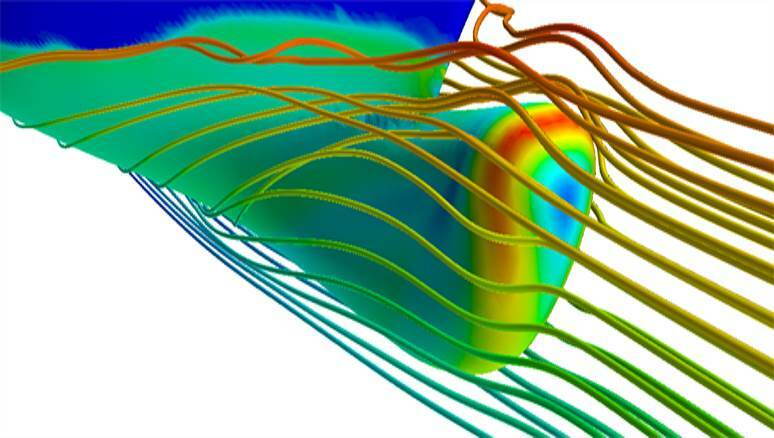 In addition, he has published over 200 research publications on the study of CFD to date. His research specialization includes numerical modeling of turbulence simulation and development of numerical discretization techniques for partial differential equations.